Milamiya is our endless love to all our beloved ones who have given meaning to our life. Milamiya represents showing love to our beloved ones and to ourselves...Wonderful GiftsMilamiya Jewelry is ideal gifts for daughters, mother, wife, sister and friends for Christmas Day, Wedding Anniversary Day, Valentines Day, Mother's Day, Ideal Graduation, Thanksgiving and Birthday.Italian DesignMilamiya Jewelry have an excellent design team from Italy. The optimal integration of high quality and delicate products.Better ExperienceMilamiya Jewelry engage in improving from comfortable wearing, eco-friendly materials to premium packages and devote to surprise user experience.100% Satisfaction GuaranteeMilamiya is committed to provide the best jewelry and the best customer services to our customers. Welcome to contact us if you have any questions. 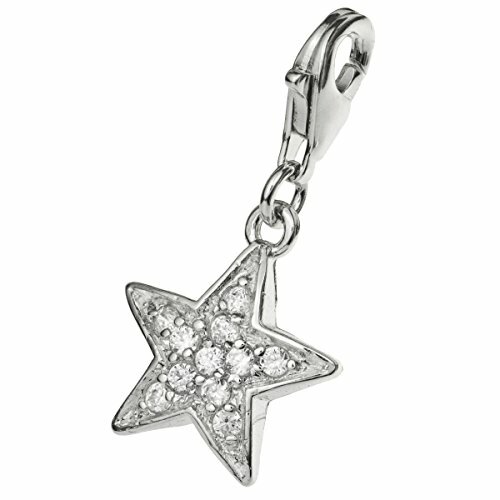 #Sterling Silver Charm 925 Sterling silver is an alloy of silver containing 92.5% by weight of silver and 7.5% by weight of other metals. Lead, Nickel and Cadmium free.Not easy to allergy. #Package Exquisite gift box with silver polishing cloth inside. #Attention *Away from chemicals *Not wearing it while bathing *Not wearing it while sleeping *No collision or Bruising *Avoid sweat *Scrub it with soft cloth (you can find one in the gift box) *Put it into the box while not wearing it #Customer Service We are committed to the production and sale of the best quality jewelry. If you have any question about order and product,please send us message.We will reply within 24 HOURS. 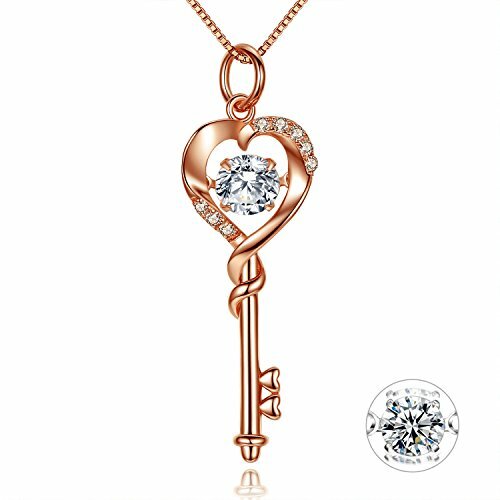 ZSML stylish jewellery, Exquisite craftsmanship, quality materials,We are committed to provide the best jewellery to you.Features:1: Every piece passes rigorous inspection, so you can buy with confidence.2: Zircon Crystal clear. Without any harmful ingredients.3: S925 sterling silver (Lead Free, Cadmium Free, Nickel Free)Great jewelry for sensitive skin.4: resistant to strong acid, strong alkali, no discoloration, not allergic. 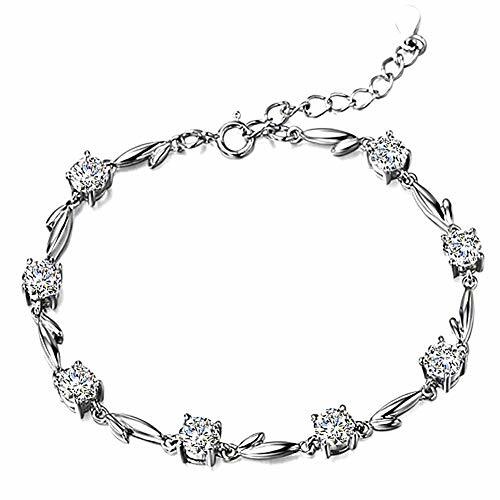 Chain is not easy to break.5: unique designs, Exquisite craftsmanship, focus on detail and beauty.DescriptionName: Zircon Bracelet bangleMaterial: S999 sterling silver+ cubic zirconiaMatch: Bracelet Easy match with all kinds of clothes, bags, shoes and hairstyles.Packaging: Bracelet is Packed in a nice gift box. Perfect for gift giving anytime.Jewellery Caring Tips 1.Please avoid contacting with the acid and alkali, corrosive substances.2.Please avoid the collision, so as to avoid surface scratches.3.Please avoid wearing it when sweating a lot, shower or sleep, etc.4.If you have more choice of jewelry,please warmly welcome to view "ZSML" to get more option.NoteThe image may show slight differences to the actual item in size,color and texture. 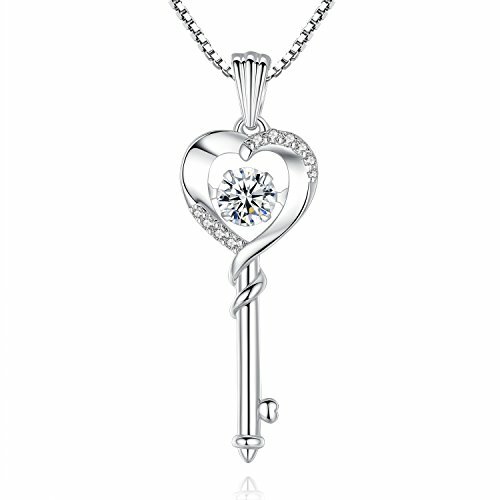 Women Pendant Necklaces Metal Type: Sterling Silver Stone Shape: Round Cut Side Stone: Multiple CZ stone 18 inches chain (chain is varys) and gift box included do it as below and it will sparkle forever! *Away from chemicals *No collision or Bruising *Avoid sweat *Scrub it with soft cloth *Not wearing it while bathing and sleeping *Avoid the sun to be basked in straight *Placing it into the box while not wearing it Stellar customer service for 30 days warranty to get moneny back: Please message us if you have any questions with our products after you receive it. It is a 100% Money Back Guarantee with no reason. Shipping: We always follow Amazon shipping requirement date to ship your product out. Please note that delivery times for USPS First Class and USPS Priority Shipping are only estimates and may take longer, particularly during peak season. If you do not receive your product during the usps estimated time, please message to us right away before you open a A to Z claim. We will try our best to assist you. ♩About Dancing Heart ♥ Inspired by the heartbeats when we fell in love, Dancing Heart jewelry is meant to have our hearts keep dancing with love forever. ♥ The beautiful stone in the middle is free to "dance" as you move and catches all the light around you. ♥ Dancing Heart jewelry is telling a romantic love story that never ends. ♪Flipped Surprise ♥ With special design of the endearing flipped stone, Dancing Heart jewelry is definitely the most romantic surprise gift for her on birthday, valentines day, memorial day, Christmas and all the special moments. ♥ Find a special gift for a loved one or a beautiful piece that complements your personal style with jewelry from DANCING HEART JEWELRY. 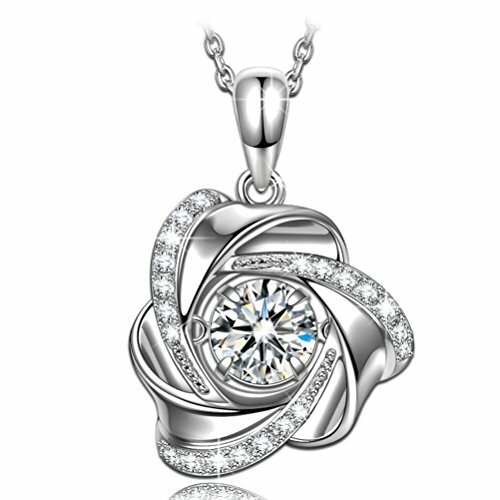 ♫Tips for Silver Jewelry ♥ When you wear: Avoid making your jewelry get in touch with mordant liquid, such as perfume, sweat, cleaner, sanitizer and so on. ♥ How to clean: To keep the gloss of your jewelry, you'd better clean your oxidized silver jewelry with silver jewelry cleaner and silver polishing cloth. ♥ How to store: Put your jewelry in your jewelry case to prevent it from contacting sunlight and damp air when you are not wearing it for a long time. 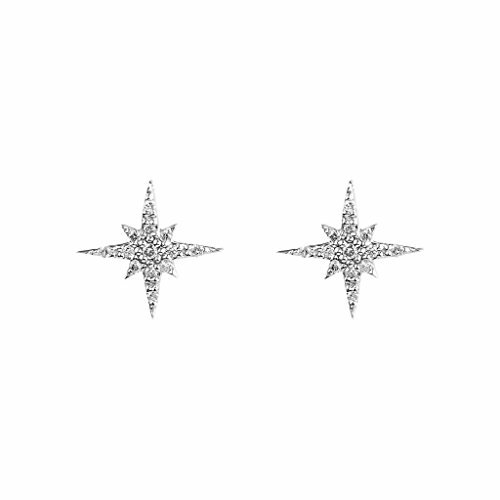 Fronay Co, Dainty little starburst designs encrusted with dazzling cubic zirconia stones set in gold plated sterling silver. Perfect for teens and up! 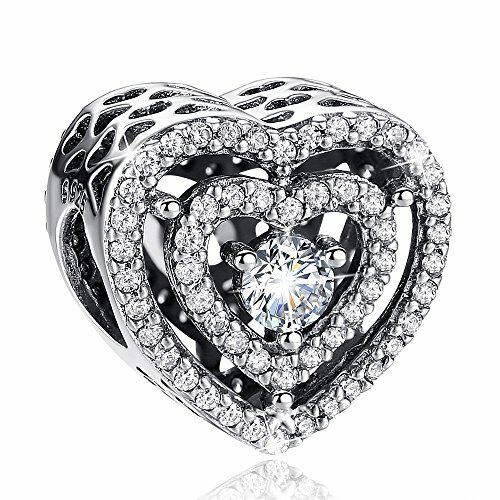 Want more Cubic Zirconia Twinkle Heart similar ideas? Try to explore these searches: Honda Cbr600rr Fairings, Rubbermaid Dishwasher Safe Spatula, and Boiler Air Vent.